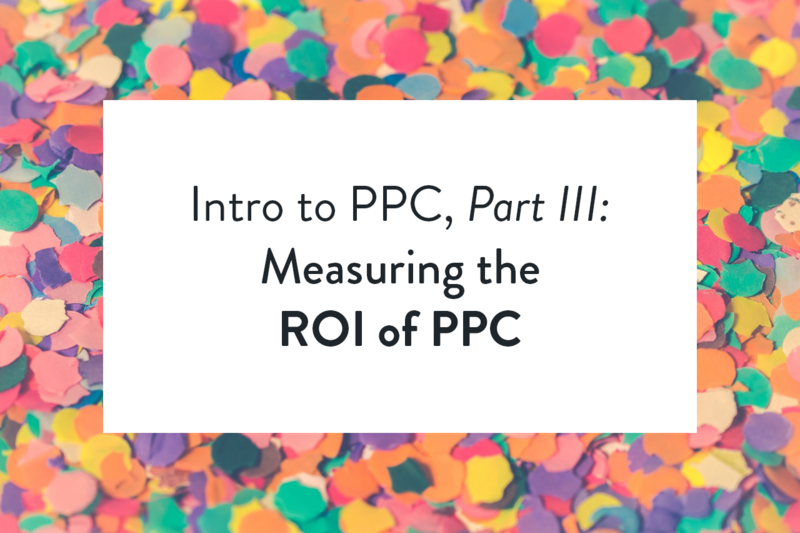 This is the final part of Hatchbuck’s introduction to PPC series. Be sure to read parts one and two first. You’ve got your keywords set, your landing pages optimized and your PPC campaign rolling. But you’re not done yet—before you sit back and watch your leads stroll in, you’ve got to make sure you’re spending your money wisely. Ultimately, the only way to do that is by measuring ROI. Measuring the return on investment you see from your PPC campaigns can help you decide if it’s worth spending on PPC, and help you understand if test or strategy is helping you lower acquisition costs and bring in more customers. How can you measure PPC ROI? There are several metrics to track for PPC, but we’ll provide a quick overview of the major calculations involved and several ways you can determine a campaign’s success. You can find out the value of your PPC campaign through all or only some of these—it will depend on what your goals are. This is the most common—and simplest—calculation you can muster up. Commonly shortened to ROAS, this metric depicts what percentage of your investment your PPC project drew in. So, for example, if you spend $100 on a PPC campaign and earn $150 in sales, your ROAS is 50%. You’ll be able to determine your own ROAS quickly enough, but you can also count on your bid management system to calculate this for you and show it in your dashboard. That’s because ROI calculates your pure return on investment, given the total costs of running your business. The calculation is the same as ROAS—profit minus cost, divided by cost. The difference? Here, “cost” represents not just PPC investment, but all the costs it took to achieve the sale: how much money it costed to make the product, the cost of your servers, your web domain cost, employee salaries and everything else you can tally up. This calculation can get a bit messier, but if you have a sense of how much your company is costing overall, and how many dollars go into a single sale, leveraging your PPC data to calculate your complete ROI is actually pretty handy. It can show you whether your advertising budget is inflated or underused and whether PPC is really a good fit for your company. These numbers will tell you precisely how efficient your PPC campaign is at achieving leads and conversions. Cost per click is an easy enough metric—it calculates how much each click cost you. You tend to choose this when setting up a PPC campaign (after all, it is literally called “pay per click”). However, it is important to keep eyes on how much each click is costing you and determine the lowest cost for the highest number of clicks. Cost per conversion is a bit trickier, as you’ll need to follow your leads through your site and determine whether they bought what you’re selling. This is only relevant, of course, if you’re actually looking for conversions—some marketers use PPC simply to raise brand awareness. But if conversions are what you’re after, you can calculate them by dividing the amount of money you spent by the number of leads who converted. If you’re paying a high price for each lead, your PPC campaign isn’t working for you. Click-through rate, or CTR, can be determined by dividing the number of times an ad was clicked on by the number of times it was shown. It’s an important calculation to see whether your ad is drawing the strongest number of leads. This is the surest way to judge the quality of your ad itself—the copy, image and tagline chosen. Split testing this is a good way to maximize CTR. If your CTR is low, you should also look at your impression share—the percentage of impressions your ad actually received, against the number it was eligible for. If your impression share is too low, it could be because your ad spend is too low or your ads are ranking low down. Of course, raising your impression share by increasing your budget doesn’t make sense if the ad isn’t performing well, if your ROI is low or if your cost per conversion is too high. Low impressions are fine if you’re still figuring out your PPC game and working with a small budget. But once you figure it out—once the data starts clicking—that’s when you know you can invest money and be confident in the ROI of your PPC campaign.